the likelihood of a tie would be greatly reduced. A tie is of no consequence unless a majority of the Electors nominate the same individuals. In their efforts to manipulate the Electors (in order to avoid a decision by the House), the political parties had unwittingly defeated their own purpose. The House was required to choose between the tied individuals. “Immediately” as specified by the Constitution, the House of Representatives convened with the Senate present as witnesses. In the House there would be discussion, debate, and persuasion as the merits of the candidates were examined. Multiple ballots would be expected. Men would have to change their minds. To reach a concurrence of a majority of the states would require patient, convincing arguments and statesmanship. Unfortunately, when the spirit of party is strong, statesmanship is hard to find. This tie situation was caused by party politics, the very thing that the Electoral College System was designed to avoid in the selection of the President. The House was divided along party lines with members of opposing parties making a choice between two Democratic-Republicans. Can anyone not be suspicious of “spoiler” motives on the part of the Federalists? They had no man of their party to vote for. The best they could hope for was to deny Jefferson the presidency by voting for Burr. At that time there were 16 states in the Union. A majority of the states (nine in this case) were needed to elect the President. On the first ballot, eight states voted for Jefferson, six states voted for Burr and two states, Maryland and Vermont were split. (Each had an even number of Representatives.) Jefferson had a plurality of half of the states, but a majority was required. As far as we can tell there was not much difference in the balloting for the first 35 ballots. No one was convinced to change his mind. Electing the best president took a back seat to partisan wrangling. It actually took until Tuesday, February 17th on the 36th ballot to resolve the controversy. Those Representatives who had voted for Burr from the states that were split, Maryland and Vermont, abstained and Jefferson was elected. The South Carolina and Delaware delegations who previously had voted for Burr also abstained. The final vote was ten states for Jefferson, four states for Burr and two abstentions. Some people claim that those states that abstained would have reduced the total number of states for the count. We reject that argument outright. We claim that the intent of the Framers was that a majority of the states in the Union was needed and that number was nine. Much of the credit for this final change of heart and concession is given to the efforts of Alexander Hamilton to convince some of his Federalist Party associates that even though there would be no necessity for them to cast their votes for Jefferson, he would be a better alternative than Burr; and that by just withholding their votes, the process would complete. It appears that the whole of the House of Representatives had become more concerned with opposing those of the other party than fulfilling their duty to select the best of the candidates presented to them by the counting of electoral votes. We quoted Alexander Hamilton extensively as he, in Federalist No. 68, defended the process of selecting the chief executive. 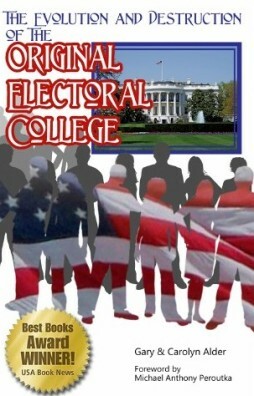 He showed that the design of the Electoral College System was a way to avoid intrigue and cabal. As the Constitution (by ratification) turned from theory to practice, Mr. Hamilton was himself caught up in party politics. While we are grateful that he did rise to the occasion in 1801, and tried to convince his party to end their partisan opposition, that spirit of party had permeated the government and largely destroyed the integrity of the constitutional intent Hamilton had so ably defended in his attempt to get the Constitution ratified in the state of New York. The blight of party animosity would not only continue but would augment over the years.